DII offers 100% cotton ribbed bath mats in two sizes and varies colors/design. Sizes include 17x24" and 21x34". The 17x24" size is great for pairing two bath mats together: one in front of the bath tub and one in front of a single sink. Or you could also pair two mats in front of a double sink for a unique look. 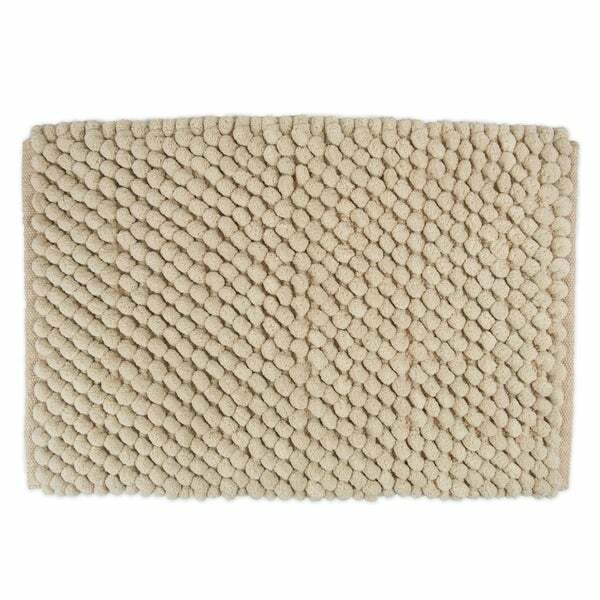 DII Chunky Bath Rugs are made with high quality Ultra Soft Chenille Microfiber with strong construction which stands up to repeated daily use. The plush material is super soft and comfortable touch on your feet and is designed to quickly absorb water, keeping your bathroom floors dry and clean. The Microfiber material allows the water held in the mat to dry quickly, leaving the mat smelling and feeling clean, dry. The Sturdy design will keep the mat looking the same even after you just got out of the shower. With the selection of colors available you can be confident that they will match your existing or new bath decor. These bath mats are awesome! I ordered the large size and it fits great in front of a steam shower door. I now longer have to mop up door drips from the wood floor after my shower. The color is great (I bought grey) and they are very high quality. It is a beautifully,soft and perfect size! It washed beautifully and it feels great when you step on it. Nice bit a skid pad is needed.